I laughed at the comic below and then almost immediately it reminded me of how unbalanced our society is. When is the last time a song, a poem, a film, or a piece of art moved you? It happens to me almost on a weekly basis. The truth is these creative treasures have the power to impact you so deeply they can actually change you. We live in a world rich with life-altering creative treasures, many of them are accessible for free 24/7 from any mobile device. The unfortunate thing is a staggeringly small percentage of the creative geniuses who create these great gifts ever reap the benefits of their valuable service to humanity. Creatives infuse our world with beauty, positive energy, they shake us from our apathy and challenge us to think. How valuable is this? More importantly, how do you put a price on it? 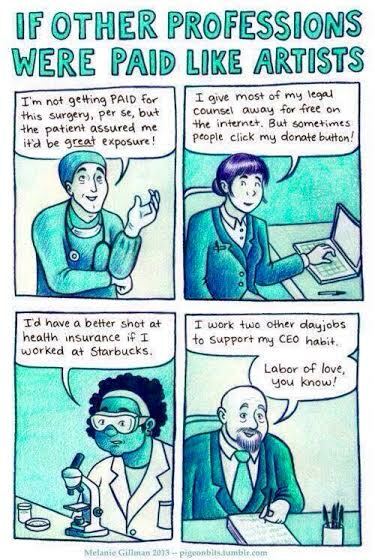 This, is the hard part for us creatives. Our creative fruits…art, literature, poetry are all subjective, what truly impacts one person might seem like crap to another. To add even more complexity, you must make a reasonable name for yourself before most people are willing to spend a dime on your work. The truth is it can’t be done overnight but it can be done. I am proof. First you must give yourself permission to be an artist or writer. You must also give yourself permission to ask people to pay a reasonable price for your work. If you work hard and create a quality product that sparks an emotional connection with others you deserve to be compensated…don’t let anyone tell you otherwise. Yes, you will have to give some content away for free at first but you shouldn’t do this for long. Keep honing your skills, continue to build your confidence, become a marketing ninja! By the same token, if you encounter another creative person whose work moves you and you are in the position to do so, buy it. Become a patron. This is the greatest gift you can give someone who is struggling. It’s not just about the money but more about the validation of their talent. That item you buy could be the first sale they’ve had in a week or a month and it will give them the hope they need to keep pursuing their dreams. I know, I’ve been there, too many of us have. The age of the starving artist must come to an end. In reality we are all just one big creative family and it all begins with us. Eric Vance Walton is a novelist, poet, aspiring world traveler, and tea junkie. He invites you to follow his unfolding story by “liking” his Facebook author page at https://www.facebook.com/EricVanceWaltonAuthor for updates and promotions on his current and upcoming projects. You can find Eric’s new book One Word At A Time: Finding Your Way as an Indie Author, on Amazon in print or as an ebook. but who am I to whine? it’s taken quite a long time but…so what? I’ve found freedom in sixty-four bars. I don’t believe in New Year’s resolutions, they seem half-hearted. Resolutions can be charming and fun but really amount to only inspirational buckshot launched into the air, willy nilly, when the clock strikes midnight. Goals, on the other hand I totally believe in and are all-powerful. Goals are our antidote to the days of our lives slipping through our fingers. Goals are like a highly trained sniper…calm, focused, and purposeful. Goals allow us to accomplish incredible things, really most anything we wish. I can honestly say that I’ve had few goals that haven’t been achieved if I’ve chased them with real intent. Believe me when I say this…I’m not special, anyone can do this. The true secret to success when pursuing your goals is the quality of your intent. It also helps if you share your goals with as many people as possible. This creates a large body of cheerleaders and mentors that help to hold you accountable and keep you on track. This list might seem lofty but my last few years have taught me that absolutely nothing is unattainable. I’ve seen the following quote in no fewer than a million memes over the past few days but it rings true with me, it reads, “Today is the first blank page of a 365 page book.” I am totally committed to making 2015 a breathtaking adventure. I’d be grateful if you stayed along with me for the ride! Much love, as always. Eric Vance Walton is a novelist, poet, aspiring world traveler, and tea junkie. He invites you to follow his unfolding story by “liking” his Facebook Author Page for updates and promotions on his current and upcoming projects. Eric’s new book One Word At A Time: Finding Your Way as an Indie Author recently charted at #7 in the Amazon Kindle Store and is available on Amazon in print or as an ebook.